Being a sea kayaker, I have a need to keep certain items of gear dry whilst on the water. The main piece of electronic gear that I have on deck is my GPS. GPS units are an awesome invention and are really useful just as long as the fundamental navigation skills don't go out the window. I use a garmin 62S mapping GPS that contains contour and street maps for all of Australia, Marine charts for the whole of Australia as well as detailed custom maps of the Amassalik area in East Greenland. The GPS is the definitive means of locating oneself in unfamiliar territory and it is worth looking after. Over the years I have tried just about every brand of drybag suitable for use with GPS units (or phones or vhf radios) including the big name brands. They have all failed rather miserably, some are poorly designed, the biggest name of all is built far too light and fails after a fairly short period of time. About 3 years ago I came across an Australian brand called Paqua. Paqua is a relatively small company run by Paul Trachtenberg. Paul designed the bags to be as tough and waterproof as possible. 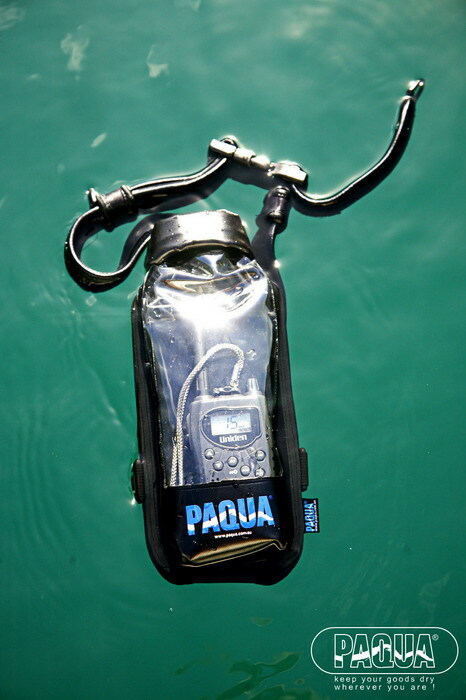 My Paqua Mobile bag has safely carried my GPS for the last three years and kept it dry every time. It has been across Bass Strait by kayak, it has travelled 260 kms by kayak in Greenland with me, and every time I go out in the kayak it comes along for the ride, whether it be surfing (and rolling, the two go together :-) or just going for a quiet paddle. It just works. Paqua have generously supplied their bags for use on my expedition.